The so far not-so-explored hill station of Ponmudi in Kerala is the best destination for those who wish to stay as far away from the noisy city life as possible. The rocky terrains, the lush greenery and the wide range of wildlife that surrounds the city make it an idyllic destination for spending vacations. 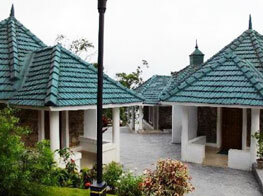 There are not many hotels in Ponmudi, but the ones that are present ensure that those who opt to stay in here keep coming back again and again. The hotel feeds on the fact that rugged Mountains surrounding these facilities are excellent for adventurous activities like mountaineering, cycling and trekking activities. Hence they arrange for adventurous tours for the guests who stay in here. Wildlife excursions to nearby wildlife sanctuaries and national parks are also arranged by these resorts. The rooms of these properties are luxurious installed with contemporary facilities and decorated with elegant decorations. The taste of Malayali cuisines is available for the guests as they prepare to stay in Ponmudi hotels. Check out the list of hotels and decide where you want to stay the next time you visit the town.